Our goal is to work with middle school students from the Bronx Academy of Letters in the South Bronx and other local schools to construct and cultivate a garden. Bronx Letters serves the students in a community that constitutes one of the poorest congressional districts in the U.S. Nonetheless, the dedicated faculty and students at the Bronx Academy of Letters are committed to establishing health and environmental education opportunities for their community. Your support through MiddSTART will help us create a garden that can provide a forum for such opportunities. Our proposal, to create an urban garden connected to a school in the South Bronx, is founded upon the belief that any effort towards peace must begin in one’s own backyard. Three of us went to high school within one block of each other in New York City, yet it took the two-hundred mile journey to Middlebury, Vermont for our paths to finally cross. 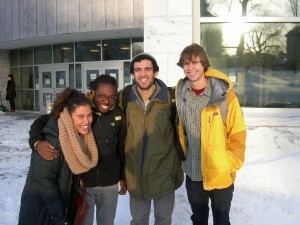 As each of us studies the intersection between environmentalism and issues of race, class, and poverty at Middlebury, the more we are drawn back to our backyards, to systemic issues in the urban world where we grew up, and to reconciling the missed opportunity for connection and collaboration that we might have had as high school students. We have decided to work with the Bronx Academy of Letters, which is located in the Mott Haven neighborhood of the South Bronx. Bronx Letters has allowed us to involve a number of their middle school students in the construction and cultivation of a garden. Drawing from curriculum guides, such as Greenmarket’s ‘Seed to Plate’ and support from the NYC School Gardens Initiative, we will frame our daily work with lessons and activities ranging from visual diaries of the progress of the garden to cooking lessons with our produce. While building the garden and kick-starting Bronx Letters’ education program is our first priority, we also recognize the project’s immense potential as a community organizing tool beyond the school itself. As such, we have invited students from three New York City schools that reside within a one block radius to play a role in the garden this summer – The Heschel School and the Beacon school, the high schools that three of us attended, as well as PS 191, a public middle school. Support through MiddSTART will help us create a garden, which can unite the community and provide the health and environmental education opportunities the Bronx Letters has strived to create. We are very excited to announce that we have 3 interns from Middlebury returning to the Bronx this summer to continue assisting the students with the garden and planning new original programming! Thanks so much to everyone who has helped us get this project started and keep it going! Everything looks so yummy! Congratulations! Thank you so much to all of our donors! This is incredible!